Outgoing WCF President Bill Guyton shared some of his favorite moments and final reflections of his tenure at WCF over the last 15 years. This year, WCF celebrated 15 years of efforts led by Bill that have focused on improving the livelihoods of cocoa farmers and the communities where they live in West Africa, Southeast Asia and Latin America. Bill’s final day at WCF is December 31. Read more in this Q&A with Bill. What were some of your biggest fears in 2000 when WCF was just being established? How did you overcome them? The biggest fear was not knowing where to start. We had a limited budget and only two people on staff. We had a vision but didn’t know how it was going to work. It was thanks to our member companies who helped us build on the dream and determine what the organization could and should be. How did the idea for WCF come to fruition, and how did you set it into motion? At the time, cocoa and chocolate companies wanted to have a better understanding of the three pillars of sustainability – economic, social and environmental. We started building on those three principles in Latin America and shifted sights to West Africa. During all of your travels around the world, you’ve met many farmers who respect and admire you and WCF. What are some of your favorite memories from the field? There are so many that stand out, but what has really struck me is how genuine farmers are and how welcoming they are to people from other countries and cultures. They make you feel like you’re part of their family. In all three regions, the pride they have in showing their farms is strong and will always stick with me. In Indonesia, I visited a women’s farmer cooperative with tree nurseries. The farmers were so excited to have foreigners come and visit, and so proud of their products and hard work. In Latin America, during a cocoa tour in Ecuador, I visited a cocoa region where the farms were so well maintained. The trees were pruned properly and there was strong production. There was also a strong cooperative there. In Côte d’Ivoire, I recall visiting one of our member companies that built a secondary school in a community where there had never been a school before. It was incredible to see the school and the community and the pride they had in having that school. It meant that their children didn’t have to travel long distances and stay with relatives in distant towns, and that they could stay with their families and go to school nearby instead. Farmers are the true ambassadors of sustainability. How can we ensure their voices are heard and considered in the grand scheme of the cocoa sector? 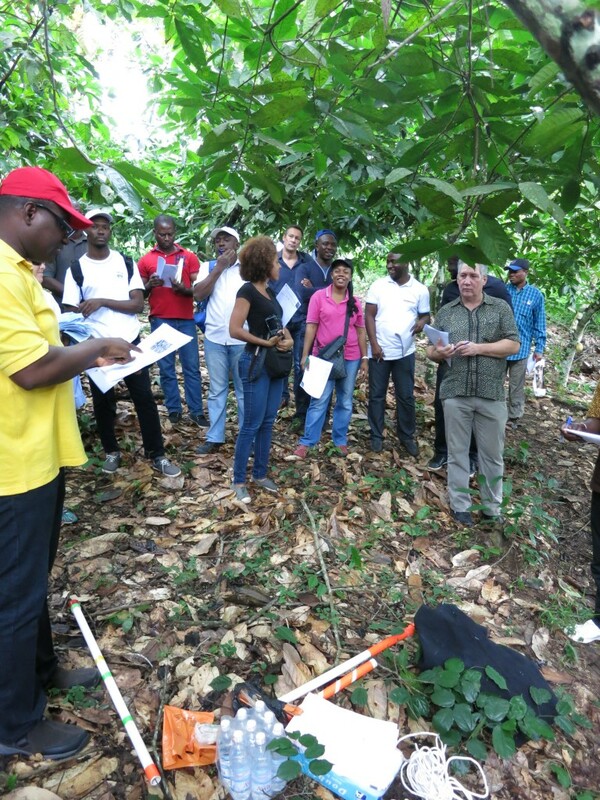 Bill Guyton meets with cocoa farmers in Côte d’Ivoire. The best way to hear the farmer’s voices is to go directly to the farms and listen. This must be done on a continual basis through constant assessments and dialogues with farmers so that we can learn what is and isn’t working for them. This way we can tailor programs based on their needs. What has been your proudest moment during your 15 years at WCF? What really stands out is the partnership with the Bill & Melinda Gates Foundation. It was truly a defining moment for WCF because it raised the profile of the organization and helped to develop new partnerships that helped us reach more than 200,000 cocoa farmers through the Cocoa Livelihoods Program (CLP). Another proud moment of mine was the May 2014 trip with the WCF Board of Directors to Ghana and Côte d’Ivoire. Watching leaders in the chocolate industry sign agreements with the governments and then going out into the field and planting cocoa trees was a proud and inspiring moment for me, and showed the dedication of the companies to have a real impact on the ground. What do you think is in store for the industry in the next 5 or 10 years? What will be some of the main challenges and opportunities? With CocoaAction, we are in a good position to really make a step change with cocoa farmers in a way that hasn’t been seen before. Seeing companies invest directly back in their own supply chains is one of the most rewarding things I’ve seen happen. The issues of climate change needs to take more of a priority in the future and we’re already taking steps in that direction to better understand how we can mitigate it. The other piece is making sure the next generation of cocoa farmers have the opportunity to make themselves proud and prosperous at the farm level. This cannot be overstated. I would like to thank the company members, our partners, and the staff who are the core of WCF. I’m proud of what WCF has achieved over the last 15 years and proud of its direction. Thank you all for your support. 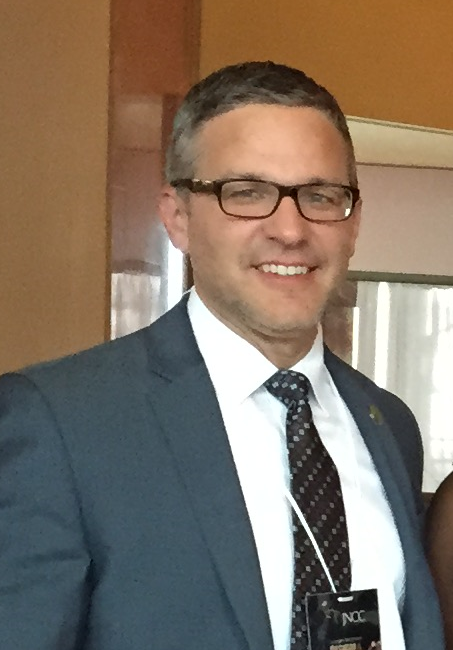 The WCF Board of Directors has appointed Tim McCoy to the role of WCF Acting President, effective January 1, 2016. Tim will serve in an interim capacity following the resignation of Bill Guyton on December 31 until a permanent successor is identified. Tim currently serves as Senior Advisor of Outreach for WCF and has held numerous roles as a senior member of the management team. He oversees WCF’s strategic outreach to the public and private sectors, member relations, and government outreach, and played a leading role in the development of CocoaAction, the industry-wide strategy designed to accelerate sustainability and improve the livelihoods of cocoa farmers. He has more than 25 years of experience in international political, economic and business development. Tim joined WCF in 2012 and is based in its Washington, D.C. office. The WCF Board of Directors has established a search committee and enlisted the support of an executive search firm to identify a permanent successor. The 21st UN Conference on Climate Change (COP21) took place in Paris Nov 30 – Dec 11 which brought countries together to decide on actions to address climate change. The goal of the conference is to decide on a new international climate agreement with the aim of keeping global warming below 2°C/35.6°F. This is the temperature at which experts anticipate serious consequences from and an increase in the number of extreme climate events such as storms, excessive rainfall, heatwaves, etc. Effects are already evident on cocoa farms and WCF is working toward making cocoa farms and farmers resilient to change. Climate change is already affecting smallholder farmers through changes in weather patterns which is impacting their farm-level productivity. Deforestation is a side-effect of climate change as farmers encroach into forest land because of old or diseased cocoa crops. Many WCF member companies have individual programs dedicated to fighting climate change. Collectively, the cocoa and chocolate industry is involved in addressing climate change through the Cocoa Livelihoods Program (CLP) by promoting farm level diversification and adaptation practices to climate change. Diversification can lead to more resilient farmers by increasing income potential, providing more food for subsistence and nutrition, and makes them less reliant on the cocoa harvest and changing weather patterns impacting cocoa. Shade management, soil management, pest and disease control, and using improved varieties of cocoa trees are also being promoted under CLP to make farmers more resilient to a changing climate. Diversifying crops can help farmers become more resilient in the face of climate change. 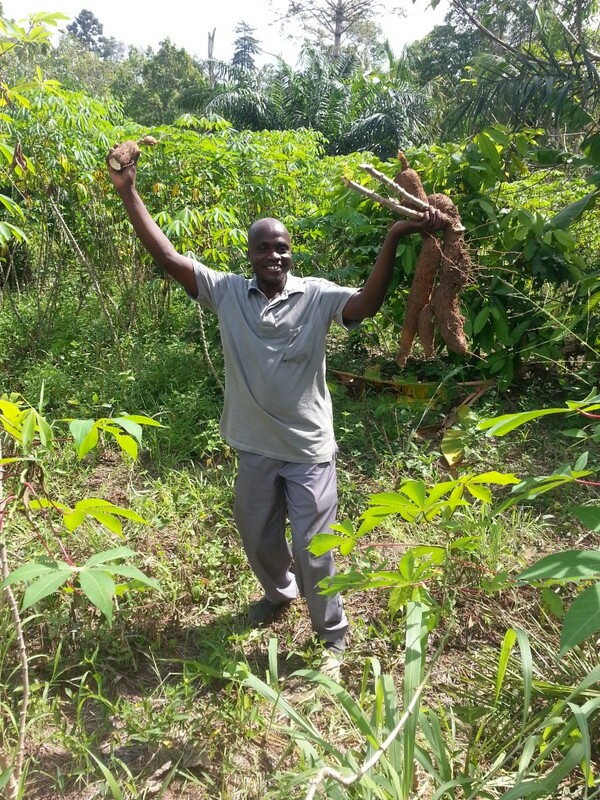 This cocoa farmer is growing cassava for consumption as well as cocoa to boost income. WCF is exploring opportunities for private sector investment and engagement that promotes the adoption of Climate Smart Agriculture (CSA) among smallholders in cocoa-producing areas. 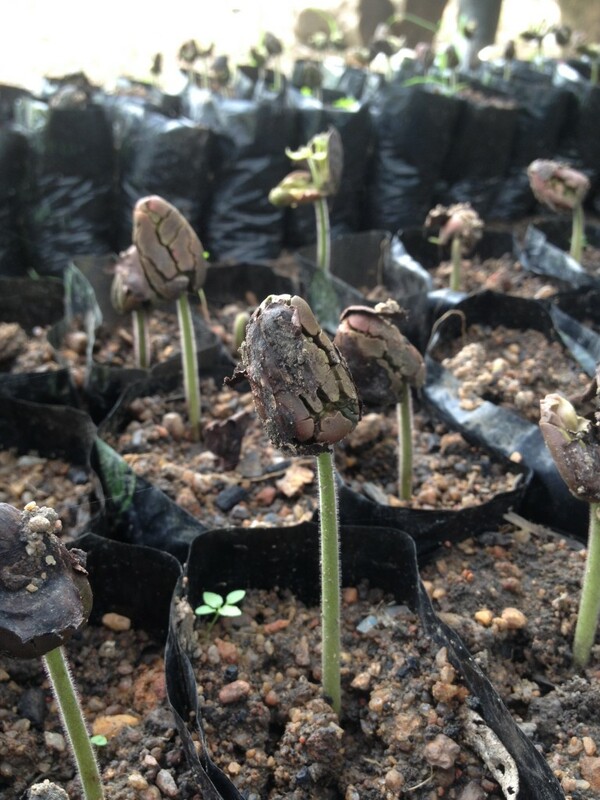 WCF and several member companies are in the early states of working with the US Agency for International Development (USAID) and other potential donors to fully define a set of initial actions to support climate smart cocoa. Read more about this opportunity on the Feed the Future website. 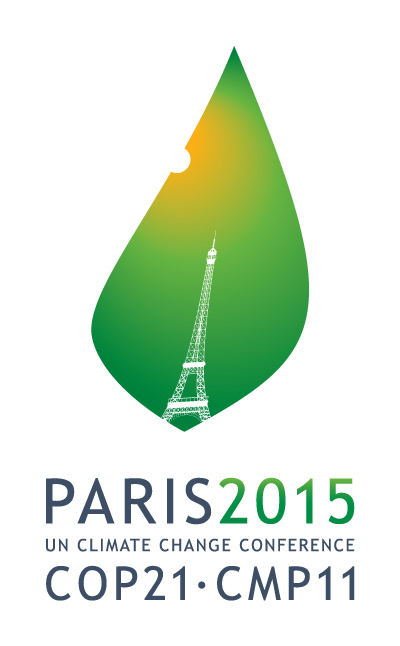 With COP21 behind us, working toward a common goal of finding climate solutions is more important than ever. The cocoa industry has an opportunity to be a leading voice in developing solutions for industry to work together through public-private partnerships and shared goals for success to ensure smallholder cocoa farmers are resilient in the face of a changing climate. CocoaAction’s newly release Progress Report highlights some of the incredible stories of collaboration that have been ongoing since CocoaAction was launched in May 2014. The 2nd edition of the report focuses on collaboration among industry and the importance of establishing common principles, approaches and measures for success. WCF has seen tremendous growth and progress toward CocoaAction’s 2020 goal. In addition to agreeing and defining the elements of the two core packages on productivity and community development, companies have agreed to a common measurement system through a shared Results Framework [more in the KPI corner]. As 2015 comes to a close, the ten CocoaAction companies are gearing up for on-the-ground implementation after many months of strategic development. The past year has demonstrated how challenging, but rewarding, collaborating on an industry-leading sustainable supply chain effort can be. Every day in CocoaAction brings new opportunities to tackle challenges together – working to gain strategic alignment, addressing individual member concerns, ensuring clear and consistent communications across all of the parties involved – as competitors work side-by-side on pre-competitive issues, sharing information and ideas in a way they never have before. Nevertheless, CocoaAction companies are committed to the rigor and the ups-and-downs of this process. Insights gained from sharing data, best practices and challenges as we work toward a common purpose will be invaluable, particularly as share we these learnings with the broader cocoa industry in the future. In the next year, WCF is challenged to identify better ways to bring other companies and organizations on board and to engage stakeholders in meaningful and constructive ways. Working in partnership with origin governments, building off of the tremendous progress they have already made, and creating intersecting efforts will be critical. The WCF CocoaAction team will work hard to build measurement systems that are both robust and flexible and that can evolve to include others over time. The new year brings with it challenges and opportunities. We hope you’ll follow our progress and share your thoughts as we continue on this journey together. One of WCF’s big highlights in 2015 was the launching of the Transforming Education in Cocoa Communities (TRECC) program. The announcement was made at the Clinton Global Initiative Middle East and Africa meeting in Marrakesh, Morrocco in May 2015. 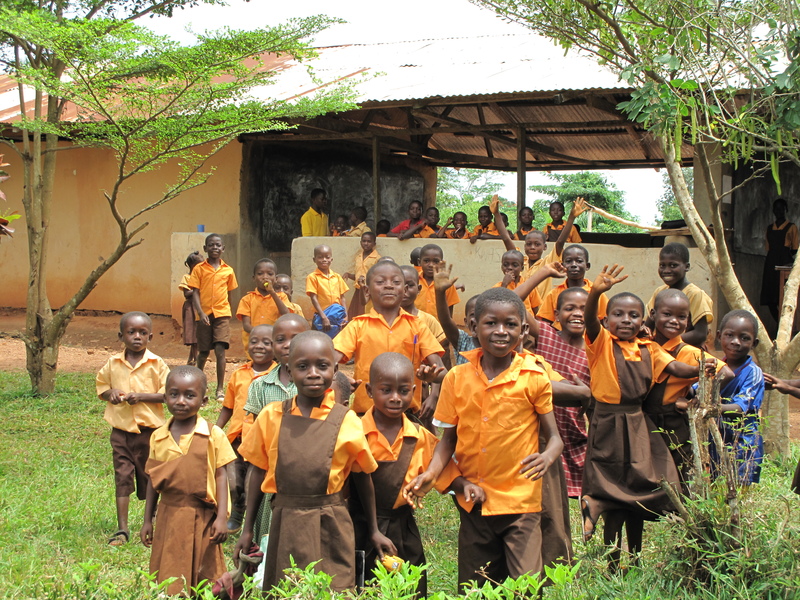 TRECC’s focus is on primary education and early child development in Côte d’Ivoire, the world’s leading cocoa producer. Following the public ‘commitment to action’ announcement in Marrakesh, WCF invited CocoaAction companies to submit matching grant proposals for community development in order to amplify or multiply CocoaAction’s impact. CocoaAction focuses on two packages of support—one for cocoa productivity and the other for community development, and under that theme efforts concentrate on three particular pillars—support to primary education, reducing child labor, and empowering women. CocoaAction’s community development pillar strengthens communities through access to education, affording children of cocoa farmers a brighter future. A key component of the TRECC program design was to determine how the Jacobs Foundation could effectively work with the cocoa/chocolate industry in supporting and extending its efforts in community development without supplanting existing investments. This is a complex and common situation faced by donors. Jacobs Foundation’s solution was to better understand where companies are investing in both productivity and community development and use that as a criteria for supporting additional investments outside of core investments that directly support amplifier activities. In the end, the Jacobs Foundation selected eight matching grant applications for the following amplifier activities: Childcare Services; School Feeding; Maternal Health; Birth Registration; Literacy; Vocational Training; Training for Women and Girls; and Village Savings and Loan Groups. The first round of TRECC matching grant call–for-proposals received a positive response and WCF is looking forward to supporting companies in developing their annual implementation plans. WCF will also be looking at supporting future calls for proposals and the TRECC learning agenda. More information will become available in the new year. West and Central Africa account for more than 70% of the world’s supply of cocoa beans but productivity is low compared to other world producers (averaging between 300 and 500 kg/ha). To reverse and improve upon this downward trend, WCF’s African Cocoa Initiative (WCF/ACI) has tested the impact of the full package of good agricultural practices (GAP), inputs, credit and planting materials with positive results. WCF/ACI sponsored the purchase of state-of-the art molecular biology tools to analyze 10,040 DNA samples of seed from bud-wood gardens in Cameroon, Côte d’Ivoire, Ghana, Nigeria and Togo. Varieties that tested true-to-type have been used to establish 130 ha and 40 ha respectively of seed and bud-wood gardens, increasing the availability of planting materials by more than 30%. With improved knowledge and capacity of breeders, local research institutes can now interpret results of DNA fingerprinting using new software, making it easier to determine results. The genetic ‘cleaning up’ of seed and bud-wood gardens, and the full package to farmers would ensure that this region continues to supply an increasing demand for cocoa beans. Cocoa from the region is predominantly traded as ‘bulk’ as opposed to ‘fine or flavor’ cocoa on the world market. However, post-harvest activities can enhance the flavor characteristics and fetch additional premiums for farmers. Seedlings in a cocoa nursery. For processors and manufacturers, flavor analysis is a common practice in the international market for coffee, but is a new concept for cocoa. By identifying flavor quality in cocoa, farmers and other value chain actors can gain market access and increase their incomes by selling high quality cocoa to specialty chocolate manufacturers. A flavor laboratory was installed at the Cocoa Research Institute of Ghana (CRIG) in December 2013 through the Ghana Quality Innovations program (GQI). With the support of WCF members TCHO and Guittard, GQI has trained a cocoa sensory panel and is transferring valuable skills that will enable CRIG to include flavor parameters to make improved decisions when selecting new breeds of cocoa varieties. This is critical to maintaining the price premium that Ghana’s cocoa fetches because of its sought after, traditional rich, chocolatey flavor profile. Because of its impact at CRIG, plans are currently underway to expand the flavor laboratory’s reach to serve fellow West African cocoa producing countries, Côte d’Ivoire and Nigeria. By building capacity for quality planting materials to boost productivity and enhancing flavor profiles for manufacturers’ chocolate recipes, WCF/ACI is having a successful impact on the industry from bean to bar. 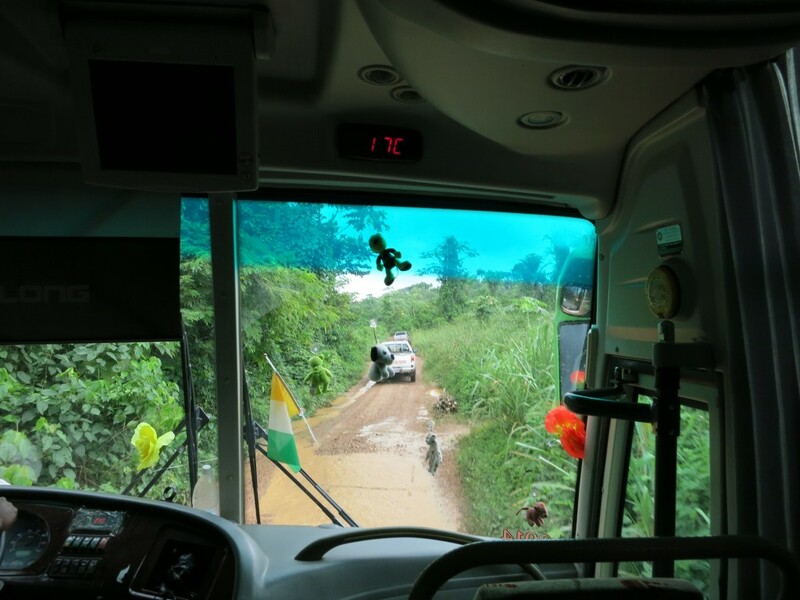 En route to a cocoa farm in Côte d’Ivoire to test data collection equipment. Partnership, collaboration and alignment have been key components of WCF Monitoring and Evaluation (M&E) efforts in 2015. This theme has been prevalent in the Cocoa Livelihoods Program, African Cocoa Initiative, and CocoaAction where WCF has worked closely to partner and promote alignment with governments, companies, donors and other key stakeholders. The results framework and key performance indicators was finalized and agreed upon by all CocoaAction companies to measure progress and support learning related to the CocoaAction strategy. As more companies and initiatives report on a similar set of aligned indicator there is potential for greater learning and sustainability impact across the industry. Demonstrating the use of data collection equipment in farm conditions. Once the logic was determined, WCF and its stakeholders collaborated in 2015 to develop an agreed-upon a set of indicators. WCF held individual conversations with expert implementers and the Voluntary Sustainability Standard organizations to gather input on practicalities and lessons learned regarding data collection on sustainability indicators. 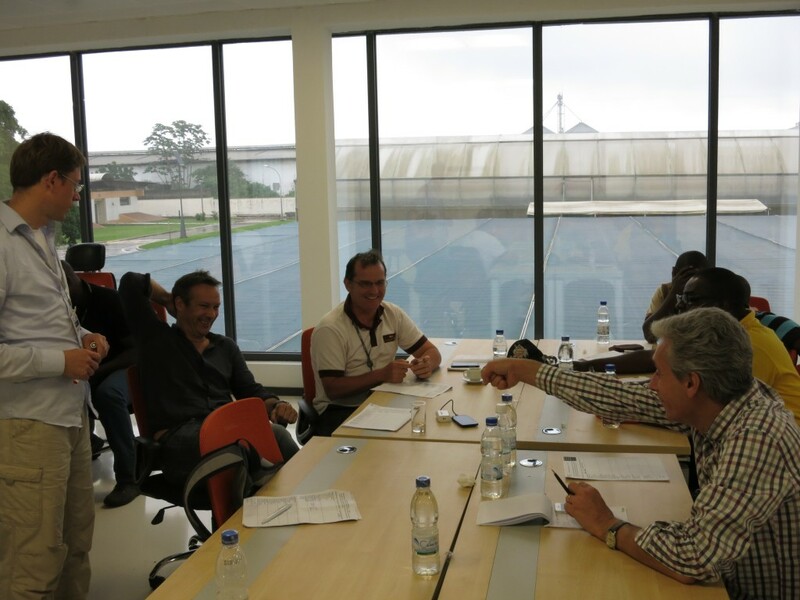 CocoaAction M&E and productivity experts met in Côte d’Ivoire to test tools and methodologies and to finalize the productivity indicators. 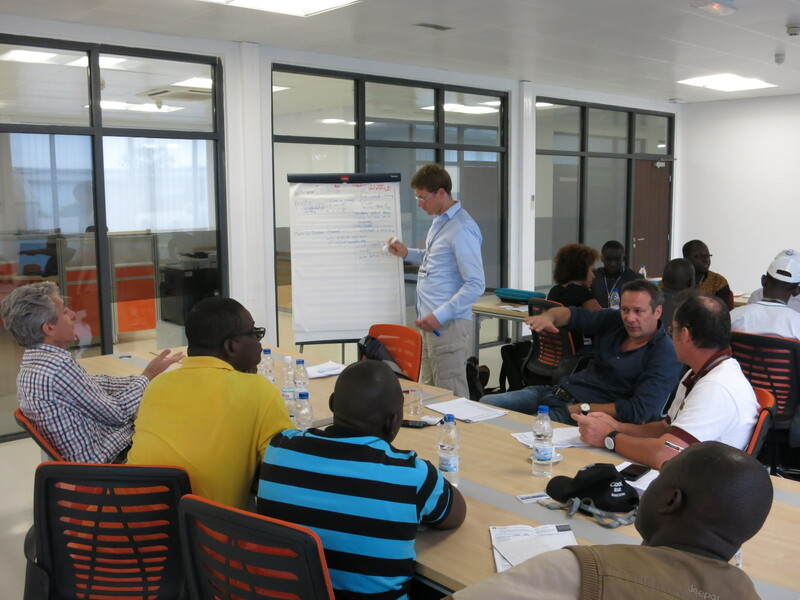 Community development experts and CocoaAction companies met to debate, discuss and agree on community indicators. In addition, WCF partnered with the governments in Ghana and Côte d’Ivoire to promote alignment between CocoaAction indicators and those of the governments. Collaboration and alignment was no simple task. 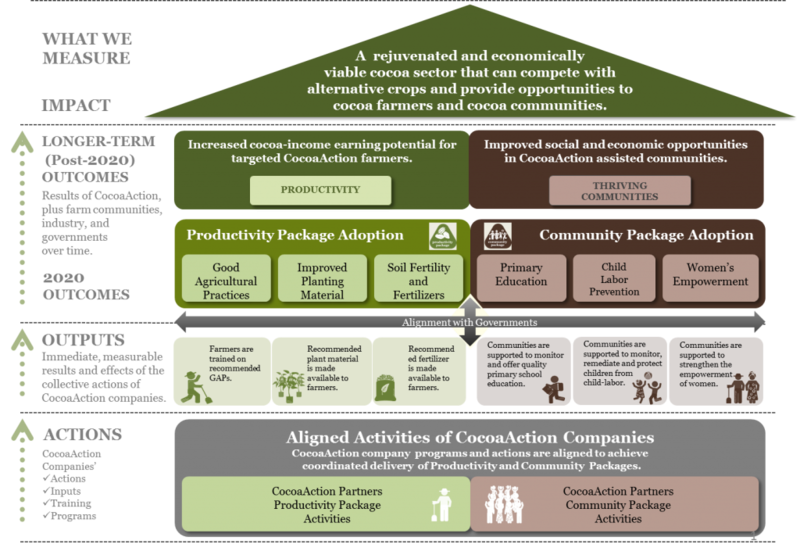 CocoaAction companies have existing sets of indicators of importance to them which are related but independent from those agreed upon under CocoaAction. We were also reminded of the importance of creating very clear definitions and the need to document and clarify decisions to ensure that companies were agreeing to the same items. Clarity is key to support positive collaboration. Figure 1: The CocoaAction “House” showing the logic behind CocoaAction. In spite of the challenges, CocoaAction companies developed an agreed-upon set of indicators aligned with the overall logic for CocoaAction. This success was due in a large part to the dedicated participation of talented representatives from each CocoaAction company and the partnership with governments, implementers and other experts. In 2016 we look forward to sharing the final indicators more broadly, implementing CocoaAction M&E, and testing our hypotheses. Companies will collect and submit data, and we will convene again in late 2016 to learn from our experience and adapt our measurement approach accordingly. 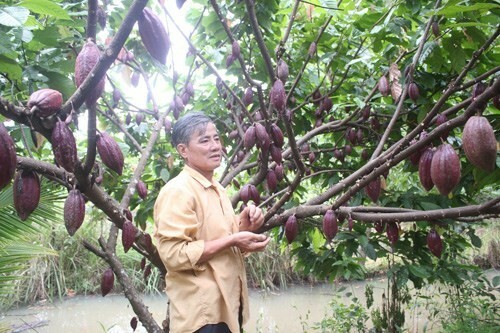 Doan Van Le on his thriving cocoa farm in Vietnam. WCF is supporting cocoa clonal trial research at Nong Lam University (NLU) in Vietnam under the guidance of cocoa germplasm research Dr. Pham Hông Dúc Phuóc. Dr. Phuóc’s work with a trial plot in the Dong Nai province served as the model for a local farmer who benefited from NLU’s research and guidance. Doan Van Le was a mandarin orange and cashew farmer in Vietnam’s Dong Nai province which he found a strenuous and expensive profession. He explored the option of growing different crops with the hope of making the workload easier and more cost effective. After discovering the nearby cocoa clonal trial plot developed by the NLU cocoa team, Doan decided to intercrop cocoa onto his three hectares of cashew. Doan soon learned that the biggest threat to his crop was Helopeltis, an insect that feeds on the surface of cocoa pods. He changed his approach and used pesticides to protect his crop. Under Dr. Phuóc and the cocoa research team’s guidance, he was advised to eliminate the use of pesticides and instead take advantage of weaver ants on Acacia trees surrounding his cocoa farm. Weaver ants actively patrol and attack pests that land on cocoa pods. As a result of this effort, the native enemy’s colony grew, and Doan’s cocoa farm was no longer under threat from the Helopeltis pest. The ants serves as a natural, safe, and efficient alternative to using chemicals to kill the Helopeltis. Ultimately in 2011, Doan decided to devote most of his time and energy into growing cocoa, and his yield has increased and is the highest in his area (over 2.5 tons/ha). He stated “I won’t grow any crops other than cocoa. I have a stable livelihood, and I no longer have to use pesticides.” A win-win situation for Doan and his cocoa trees. Marlon Lopez served as a Fellow from September to November 2015 under the WCF-U.S. Department of Agriculture/Foreign Agricultural Service (USDA/FASARS) Cocoa Borlaug Fellowship program. The Norman E. Borlaug International Agricultural Science and Technology Fellowship Program/Global Cocoa Initiative supports the exchange of cocoa scientists from the Americas, Southeast Asia and Africa to complete a two-to-three month research fellowship in the United States, acquiring skills and knowledge that can be shared in their home countries. As part of his Fellowship, Marlon studied under the mentorship of Dr. Osman Gutierrez, a research geneticist at the USDA/ARS research facility in Miami. The focus of Marlon’s Fellowship was on frosty pod and black pod diseases with the goal of identifying genetic material that could lead to improved disease resistant clones in the future. He collected cocoa samples from different areas of Honduras for use in his experiments, which are ongoing. Marlon works for the Cocoa and Agroforestry Program with the Fundación Hondureña de Investigación Agricola (FHIA) and coordinates the PROCACAHO project, which provides training to cocoa farmers in Honduras on increasing productivity, and improving quality through agroforestry and technology opportunities. He received a Master’s degree in plant breeding from the Universidad Austral de Chile. Marlon will share the results of his research with colleagues from agricultural universities in Honduras. He also plans to continue collaboration with Dr. Gutierrez to further evaluate clones under ecological conditions in Honduras. Marlon plans to pursue a doctoral program in cocoa plant breeding. 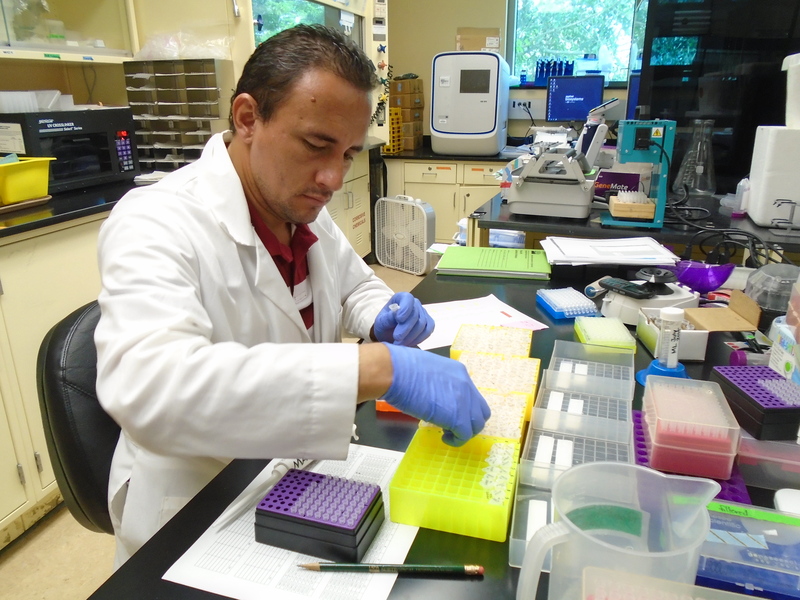 Marlon Lopez testing cocoa samples in a lab. WCF is thrilled to announce UK retailer, Tesco, as our newest member company. WCF warmly welcomes Sari Nurlan (Industry Liaison) and Rijal Idrus (Research and Environmental Specialist) in WCF’s Indonesia office, and Adam Mead-Long (Program Assistant) to the DC Office. WCF extends its thanks and best wishes to Sophia Yang (Finance Intern) Jamila Abdulkadir (Communications Intern) on their future endeavors.